Within the grid underlying the whole document, in this project I’ve used that as a basis for breaking up the content with geometric shapes. This was partly to draw out visual interest in the document as a whole, but thematically to emphasise the dynamism of Buddhafield. 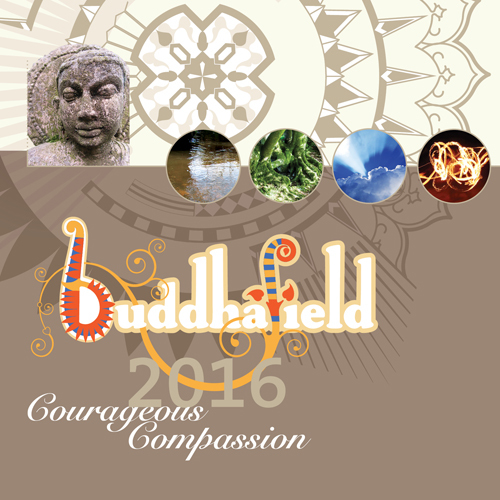 See the whole Buddhafield 2016 brochure. I set up a rigorous type hierarchy to ensure that, amidst the dynamism of the composition, the functional underpinning of the document — the publicising of the programme of events — didn’t get lost. Event titles, The Serif, part of Lucas de Groot’s Thesis super-family. Event details (dates, venue etc. ), ITC Flora, designed by Gerard Unger. Body text, Praxis, also by Gerard Unger. Theme and credits, Snell Roundhand, by Mathew Carter. Some of the main headings are graphics in their own right. 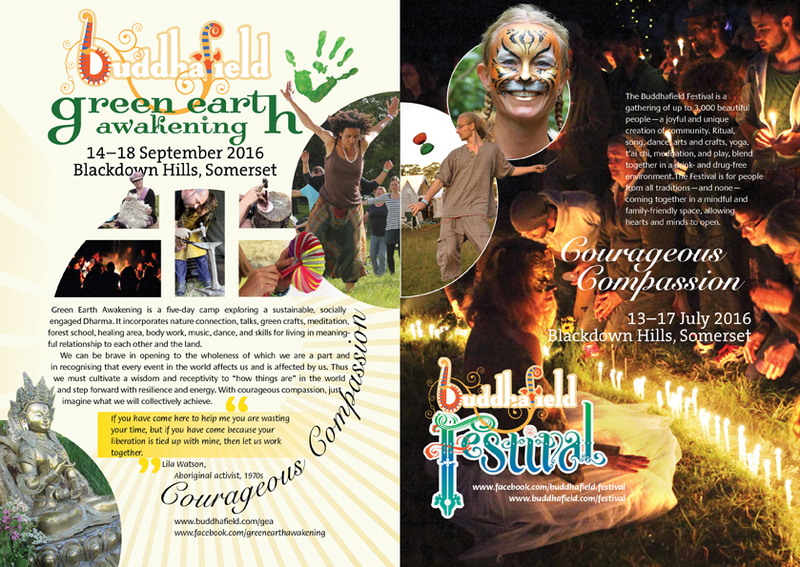 The Buddhafield Festival graphic was a custom designed. The lettering on the Village Retreat spread is by designer-illustrator, Sara Nunan. This project demonstrates the application of Typography Adobe Photoshop, and Typographic grid. Follow the links to see more projects using these skills.